Mode 7 is a complicated process that is oh so easy to explain, the most notorious user of this graphical style being the SNES. It was impossible to not notice Nintendo’s push to boast mode 7 graphics in its advertising and even if you were able to ignore it, the launch games for Christmas 1991 and beyond. Basically the SNES was capable of seven different graphical modes, some adding multiple layers (up to 4) and others allowing you to manipulate and rotate a single layer (mode 7). It was a way to fake 3D and depth in early games and while Nintendo wasn’t alone, consoles like 3DO were expensive and the Genesis required the Sega CD add-on to feature graphics like mode 7. If that was all jargon to you, it was the ability to make the screen rotate and zoom on pixels. 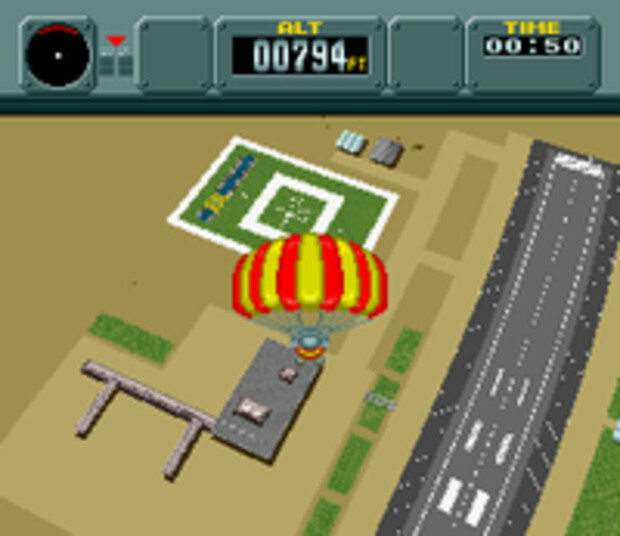 When you played Pilotwings, your character wasn’t actually falling into a perceived depth, the world that was created below was just zooming and rotating as you pressed d-pad buttons. If you pay attention you’ll notice your character stays fixed in the middle of the screen, like an early arcade racer. Pilotwings wasn’t alone either, almost every early SNES game had mode 7 graphics as some sort of flashy show-off gimmick. When Bowser flew at the screen in Super Mario World or a foot soldier was tossed toward you in Turtles in Time, these were mode 7 graphics at work. When the logo of Actraiser did a dance across the screen mode 7 was responsible. 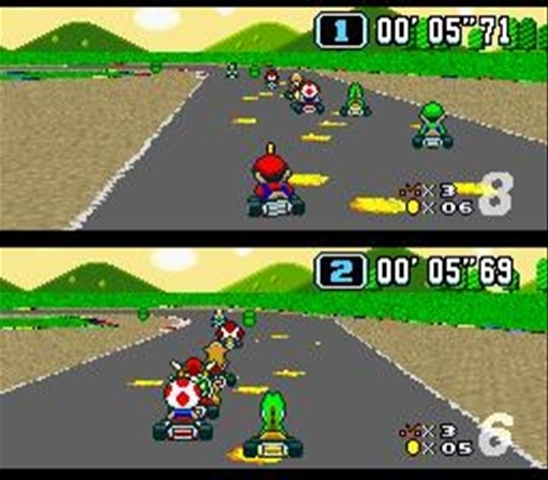 Most notably was the ability to see racers both close and off in the distance with a sense of realism in Super Mario Kart, especially with that technically stunning opening sweep of each racer from Lakitu’s camera perspective. 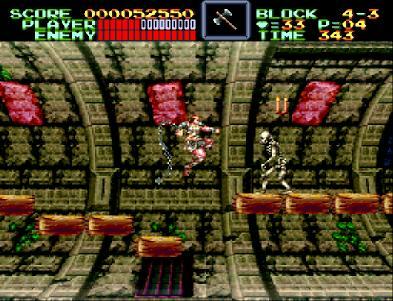 As for me, when I finally got a SNES in 1994, the first game I wanted to play was none other than Super Castlevania IV. As an avid fan of the Castlevania series I had thoroughly played the first three games to their challenging conclusions. Even in early Nintendo Power issues I had been dazzled by the high-end graphical style of Castlevania IV and it remained a game I couldn’t wait to play. Not only did this title seem more manageable – the multi-directional whip made killing annoying enemies much easier, if not the entire game as a whole – but thanks to mode 7 every trick in the book was utilized. The world would turn upside down, the screen would rotate, Konami even had some tricks that created the crazy “in the barrel” effect that you see in the screenshot. One of the biggest trademarks of consoles were that software manufacturers made them do things they were never intended to do, from Atari to SNES and beyond. Mode 7, on the other hand, was specifically designed into the Super Nintendo and no title showed off all the crazy things that hardware could do better than Super Castlevania IV. If you still have an SNES and have not touched this technical gem, you owe it to yourself to see mode 7 in all its glory. My mode 7 is broken on my snes. I have recently been playing Zelda secret of mana and secret of evermore and the mode 7 overworld maps are all messed up. Is there anyway to fix this? Wow, this is a rare issue, but it does exist and I knew a guy much smarter than me who had that very problem. I contacted him and his news was promising, but probably doesn’t offer much true help. Basically this is an issue with the S-PPU1 (5C77) 100 pin QFP chip (found in the internal components of the console but exact location was not provided), but replacing that should solve your problem. Unfortunately this requires you to find a working chip of that kind (they were difficult to create and used specialized manufacturing), which can only be found in another SNES. If you’re lucky enough to find a broken SNES with a power supply or motherboard issue, this shouldn’t be a problem provided the chip still works. On the other hand all this headache may be better remedied by a $30-$50 repurchase of the SNES. Still, a good working console is hard to come by and if that’s the only problem you may want to consider breathing life back into this machine by swapping out the chip. Hope this helps, feel free to ask questions anytime. Also if you have any pics or video of how a broken mode 7 chip looks, I’d actually like to see that. You can e-mail anything you have to me in the “contact” section of this site. Greetings, I think your site might be having internet browser compatibility issues. however, if opening in IE, it’s got some overlapping issues. I merely wanted to provide you with a quick heads up! Apart from that, fantastic website! Thank you for the feedback and the heads up. Since I am a one-man team I may need a bit of time getting everything optimized for all browsers, but I will try to fix this IE problem ASAP.